Moss-Pink. 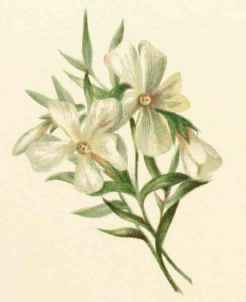 Phlox Surulata, Linnaeus. Natural Order, Polemoniaceae. 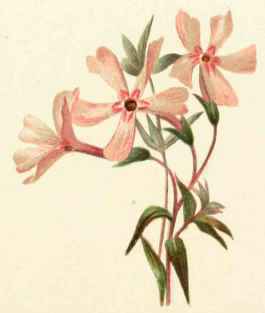 THE Phlox is an American genus of plants, but was one of the earliest to obtain an introduction to the botanists of Europe. Plukenet, a writer before the time of Linnaeus, published a work in London, in 1691, in which he describes it, making it out to be a near relation to the Lychnis, for which reason he called it Lychnidca. The Lychnis belongs to the Pink family, or, as we say, Caryophyllaccae, and there is much outward resemblance of the Phlox to it, especially in the seed-vessel; but on examination, we see that, while the Pinks have numerous seeds in a cell, the Phloxes have but a single seed. Besides this, the Pinks have a corolla made up of several distinct petals, while the Phloxes have but a single or monopetalous corolla, although divided into five deep segments. When Linnaeus remodelled botany, he generally retained the old designations if they did not conflict with the requirements of his system, but Lynchnidca was one of the names which had to give way. In the first place, the name implied a close relationship to Lychnis, which the plant did not have, and thus would mislead. Its form, moreover, was that of an adjective rather than of a substantive, and the system of Linnaeus called for an adjective in addition to the substantive. But as Lychnis ("lychnos") is the Greek word for "lamp," Linnaeus changed the name of the genus to "Phlox," which means "flame," and in this metaphorical way still retained a connection with the original name of Plukenet. The relationship of the Phloxes is not with Caryo-phyllaceee, but with Greek Valerians, with which, and some others, they form the natural order, Polemoniacecc, of which there are numerous representatives in various genera on the American continent. As the Phloxes are strikingly different in appearance from most of the plants which were cultivated in Europe at the end of the seventeenth century, their introduction must have been a rare treat to lovers of gardening. The tall forms of Phlox, especially P. Carolina, found their way into the gardens about 1720; and Peter Collinson, that rare lover of American wild flowers, boasted of several others a few years later. In a letter to John Bartram in 1765, he refers with pride to them, 'and remarks, "It is wonderful to see the fertility of your country in Phloxes." He would have wondered more if he had seen the beauty of the many which have been discovered since his time. Even the one we now illustrate was, probably, unknown to him, as it was not till 1786 that it seems to have been introduced into England by John Frazer. But beautiful as this species is in gardens, no one can have any conception of its grandeur when seen in some of the wild places where it finds itself perfectly at home. Dr. Darlington, in his Flora Ccstrica, remarks, "This species is chiefly confined to the Serpentine Rock (in Chester County, Pennsylvania), and when it is in full bloom, the hills, at a distance, apppear as if covered with a sheet of flame." The writer of this has noticed the same lurid appearance of the hills from the flowering plants along the line of the Schuylkill River, as, no doubt, have other observers in other places. It is one of the earliest of all plants to flower in this region. If the autumn be mild, as in Pennsylvania it often is, flowers may be seen as late as in November, while it is not unusual, after a few mild days in the spring, to find some which seem to have opened under the snow, like certain kinds of plants in the Alps of Europe, which, according to Kerner, blossom under similar circumstances. Many Phloxes die completely back to the ground, but this one trails or creeps along on the surface, keeping its leaves as green as moss, and indeed, from this character, has obtained the name of "Moss-Pink." It is also called "Mountain-Pink" and "Ground-Pink"; but the two last names are, perhaps, used only by those "who gather wild flowers," for the commonest garden name is "Moss-Pink." The "Moss" is appropriate enough. "Pink," however, does not properly belong to this genus, but to Dianthus, or that family to which the Carnation belongs. It is, doubtless, one of the true Pinks to which Wordsworth refers when he says, "The wild pink crowns the garden wall, And with the flowers are intermingled stones, Sparry and bright, rough scattering on the hills." At any rate, Wordsworth's plant is not a Phlox, as this does not grow wild in Europe; but our Moss-Pink grows in our country under such similar circumstances, and the flower itself is so like to the real pink of the poet, that the quotation seems to be quite appropriate. All throughout the New England States it delights to grow on rocky hillsides; but as it wanders south, according to Chapman, it takes to low, sandy places. It is found wild in all the States south of New York to Florida, and west to Michigan and Mississippi. In the Rocky Mountains and thence westward, its place is taken by other caespitose forms which are indirectly allied to it. One species somewhat similar also occurs in Siberia, and this is the only one found outside of the United States. Writers on medicine have nothing to say about the Moss-Pink, but it has succeeded in attracting the attention of philosophers, for Mr. Darwin gives it a special notice in his "Forms of Flowers." Dr. Gray had noticed that the plant was heterostyled; that is to say, had the pistils in some plants shorter than in others. In olden times, when these points were not understood as they are now, this short-styled character was thought sufficient to build another species on; and hence Nuttall made one as P. Hcntzii, in which this was the chief distinction. It shows how great has been the progress of botany even since Nuttall's time, when we see that what are now known to be little more than sexual differences, were then taken to be essential, specific characters. It is this peculiar variation in the length of the pistil that has been noticed by Mr. Darwin. Generally, he found the pollen grains different in size in heterostyled plants; but in this species he found no difference, or, rather, both large and small grains are found on each form, and this he regards as very remarkable. He concludes his notice of this phenomenon by suggesting that "possibly this species was once heterostyled, but is now becoming sub-dicecious, the short-styled plants having been rendered more feminine in nature. This would account for the ovaries having more ovules (two instead of one), and for the variable condition of their pollen grains. Whether the long-styled plants are now changing their nature, as would appear to be the case from the variability of their pollen grains, and are becoming more masculine, I will not pretend to conjecture." Still, the bare suggestion will have an interest to those who arc studying what are known as the facts of evolution. Mr. Darwin has evidently a deeper interest in our little plant, in this connection, than his expression, "I will not pretend to conjecture," implies; for in another part of his work, he says, "Certain appearances countenance the belief that the reproductive system of Phlox subulata is undergoing a change of some kind." The extracts show with what interest our Moss-Pink is being regarded in science. To the florist the Moss-Pink offers some attractions. It is not only of easy culture, but is extremely variable in nature, both in color and form. We give some variations on our plate; but there are changes in form as well as in color. prev: Yellow Dog-Tooth Violet. Erythronium Americanum, Smith. Natural Order, Liliaceae. next: Early White Saxifrage. Saxifraga Virginiensis, Michaux. Natural Order, Saxifragaceae.